A look at the final auction prices, closeouts and more from the domain auction list posted on April 21, 2019. The post AUCTION RECAP OF APRIL 21, 2019 appeared first on DSAD. KabobHouse.com sold for $3,000 on Sedo. The name went to a small restaurant chain with four locations in Washington state. Restaurant names like this can be found in the drop almost every day. I buy some of them, but I don’t remember if I’ve ever sold one. I always feel like small restaurant owners are pinched enough and probably not willing to fork over much for their domain. This is a nice sale. HotelRegina.com sold for $2,050 on Namejet. To me, this looks like a nice little avoid a UDRP buildout. The ideal buyer of the name would be the Hotel Regina in Paris. The current buildout claims to be a guide to the hotels of Regina, Saskatchewan Canada – although I can’t find anything about any hotels in that area on the site. SwimmingPool.de sold for $14,408 on Sedo. 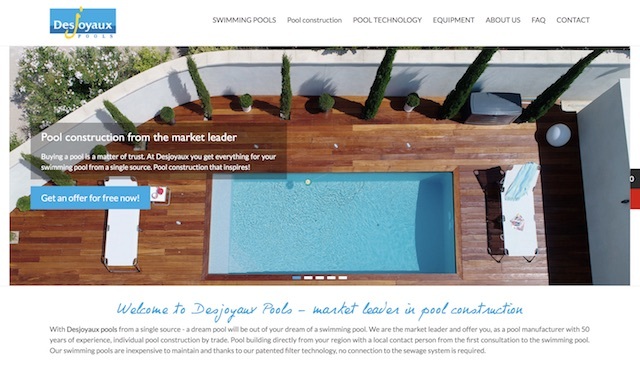 The name redirects to a German swimming pool builder called Desjoyaux Pools. I’m not familiar with the .de domain market, but this seems like a really nice sale to me at over $14K. In German, it would be schwimmbad.de, but that is already in use. Maybe this is the next best thing. Smilestones.com sold for $4,950 on Sedo. It is a cute play on smile and milestones but also a name that means Swiss Mile Stones. Smilestones is a miniature world at the Rhine Falls in Switzerland. PestBox.com sold for $2,500 on Sedo. The name redirects to domyown.com’s new pest box pest control subscription service. “Get the professional pest control products you need to prevent pests throughout the year, customized to your home’s size and location.” There are a ton of box names in use by companies, because subscriptions are real money makers. The post Recent Domain Sales That Have Been Developed: KabobHouse.com, PestBox.com & more… appeared first on DSAD. I love and appreciate Namejet. Its positive for our industry to have as many options for buying and selling names as possible. They pay us to promote names as well as sellers to help them individually promote names at auction. But it now takes me two to three times longer to peruse the selling list even though there are half as many names at auction. Big portfolio owners sell their domains through Namejet which is a good thing. It puts higher quality names in front of us to be able to buy. The problem is the owners understandably don’t want them to go cheap so they put a pretty high reserve on the names. And I don’t have a good tool to see the reserves in a spreadsheet form. That means every name I like I have to click on the name and see what the reserve is. 9 times out of 10 its a bit higher than what I deem a wholesale price. I put names on the list that I think will make reserve and I’m almost always correct on whether these high reserve names sell. I don’t want to get you excited with a good name and then it has a $25K reserve. So look and click, look and click. This is not the fault of Namejet. They absolutely should take these names. They are great names and some sell. It’s a me thing. I need better tools to filter by reserve. GoldenState.com Big boy/girl name. On Sherpa we thought the name may be better than California. What do you think? Better? The post Domain Shane’s Daily List of Domains at Auction for Monday April 22nd, 2019 appeared first on DSAD. DomainSherpa UDBQ domains UDBQ Comments Off on ICA Webinar: Registry Agreements, UDRP reform, Price Increases & more! Today: 59795.com sold for $3,020 / Share Your Real Dictionary Word Domains / Namescon Europe 2019 / And more! Official .Wine Showcase, Discussion, Sales – Are you investing in the new gTLD .wine? What do you own? Interesting in what other .wine investors put their money in? Check it out! Share your .io One-Word Domains Only – Do you have any single-word .io domain assets in your portfolio you’re proud of? Showcase them and see what like-minded investors own. Hallmark Continues to ‘Cash-In’ On Premium Holiday Web Name “Easter.com”, Or Does It? – Easter.com redirects where? What do you think about Hallmark’s marketing strategy with that domain asset? 59795.com sold for $3,020 – That’s not a bad domain name sales report for a five-number .com for four-figures. Do you think it should have sold for more or less than what it sold for? Namescon Europe 2019 – Who else will be attending Namescon in Europe this year?Take a look at who else will be there and what’s being said about it. Share Your Real Dictionary Word Domains – Do you have any genuine dictionary-word domain name assets in your portfolio? Share your best ones and compare notes with what other investors own. A 20 year old domain investing mistake resonating today – Have you ever made a mistake like this two or more decades ago and just recently realized it? Check out this great story from a veteran first name .com owner.